It’s such a good feeling to finish a long project. CommSec Cash Management was an interesting project to work on. Put simply, it’s a self-contained bank within a bank, offering high interest savings and transactional accounts, Debit Master Card, Internet banking, full back office capabilities and integration with existing CommSec’s trading products and Commonwealth Bank’s existing payments systems. Building such a thing from the ground up was quite an experience from professional point of view; it was a long project too (started prototype in August 2007, started development in September 2007, pilot in April 2008, went live for public in June 2008). Two weeks after launch – no major issues, which is even a better feeling. Previously I’ve blogged about my favourite Windows Mobile applications. Now it’s time to write about my favourite software for OSX. Even though my Macbook Pro came with a whole bunch of useful software, there were few gaps required attention. Quicksilver. While OSX built-in search facility, Spotlight, is pretty good, Quicksilver simply kicks arse! It’s super fast and finds everything. Amazingly, it’s free. Google for Quicksilver tutorials and you will discover why this is a must-have tool. Perian. If you watch DivX, AVI, XVID files on your Mac, it’s a must have, especially considering it’s price ($0). Integrates into QuickTime and I haven’t come across a fileit couldn’t play. VLC Player plays pretty much everything and it’s free. MacTheRipper is good for grabbing DVDs. Toast Titanium is an equivalent of Nero in Mac’s world. TextMate is a fantastic text editor. Not free, but worth every penny. Cyberduck is a FTP client for Mac. Good. Free. Read eBooks in CHM format on your Mac? Chmox is the best (and free) tool. Adium is the best chat client I’ve found. It supports AOL Instant Messenger (Including ICQ and .Mac), Jabber (Including Google Talk and LiveJournal), MSN Messenger, Yahoo! Messenger (Including Yahoo! Japan), Bonjour (Compatible with iChat), MySpace IM, Gadu-Gadu, Novell Groupwise, QQ, Lotus Sametime. VMware Fusion is heaps better than Parallels. I use it to run Windows XP and it’s fast enough to bother with BootCamp. Remote Desktop Connection for Mac. I use it to connect to any Windows box, but mainly my desktop machine. If you use any other Mac software worth mentioning, please leave a comment here or contact me. 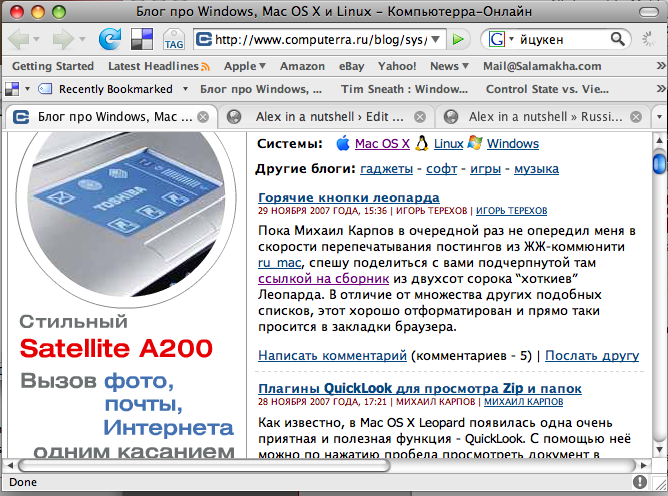 I’ve recently posted a quick fix to Firefox’s problem with displaying Russian fonts in OSX. Here is another fix: Install Firefox 3 beta. It works. And it’s a better browser too. Don’t forget to read on how to get your old Firefox 2 extensions work with Firefox 3. I’ve been complaining about Firefox being a memory hog earlier, so I decided to try new Firefox 3 beta 2. 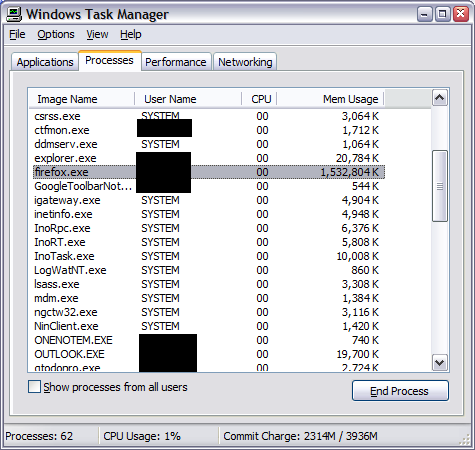 It’s been a lot less aggressive in its memory consumption and is quite stable, which is a fantastic result for a beta. On the down side, most of my add-ons stopped working. I can live without many things, but I can’t live without Yahoo del.icio.us and Web Developer add-ons. All your old add-ons will try to work and most of them will. At least both Yahoo del.icio.us and Web Developer add-ons work just fine for me. UPDATE: this no longer works for Firefox 3.6. Click here for the solution for 3.6. Finally, last week, after Firefox hung yet again using 100% of processor and over 300mb of memory, I decided to give Opera a go. WTF, Firefox team? Is it time to give another browser a go to acheter kamagra? One of the annoying problems of OS X Leopard upgrade was Firefox’s problem of presenting Russian characters – all buttons, text boxes and other controls contained question marks instead of characters while web pages were presented well. Quit Firefox. Go to Applications folder and Right click on Firefox. Select “Show Package Contents” from the menu. Navigate to Contents -> Resources and rename en.lproj directory to ru.lproj directory. This feature is for flexibility, however, I haven’t found a need to use it the way it was intended. On the other hand I have encountered a number of situations where developers copy-pasted code responsible for creation of a validator without changing the type of a target object. This results unexpected behaviour during testing. Usually it makes sense to have a base business object class anyway, so it’s not much of an overhead.